Every time I’m with Uncle Gerry I cry. Not tears of sadness, but tears that come from a place deep within when I know that I am connecting with someone – understanding someone – and also being understood. I’ve cried when we’ve been singing together and I’ve cried when we’ve been talking together and it’s all good. Don’t let his 6 foot 4 stature fool you – he’s a huge Irish teddy bear with a heart of gold, a voice like velvet, and the kindest, most loving eyes. Uncle Gerry visited Austin this past week accompanied by his equally kind and loving wife of thirty years, Aunt Denise. During this time I had a chance to sit down with him and ask him a few questions. There was laughter and of course, like I said, tears. What was your childhood like musically? My childhood musically was very rich. My mom and dad both loved music…particularly my dad, he had a great voice, I was always envious of my dad’s voice – he had a wide, wide range and he used to sing these old Irish songs. He was a true Irish tenor. I was always in awe of my dad that way. We always sang in the car – dad would always start us singing – he was in a barbershop quartet, but he also just knew a lot of songs from his whole life. We sang when we did the dishes, families used to do dishes together! So every night we would do the dishes and we’d be singing and also, after we did the dishes, we would dance in the family room – my brothers and sisters and me – so it was really rich that way. When we went to church my mom and dad would sing real loud. I remember we all asked them one time if they could sing more quietly in church so we could hear somebody else singing! So they were enthusiastic singers and obviously, they passed that on to you. Yes, we all really had a lot of fun. My sisters and I could still sing a few of dad’s old barber shop quartet songs because he always sang them around the house. There was a lot of music and I always loved it. I always had a powerful voice as a kid and luckily, Sister Mary Carol started a boys choir at my school when I was in the sixth grade. She came to all the 6th, 7th, and 8th grade classrooms and announced this to all of us and for her it was a dream come true. It was for me too because I remember being a kid watching a movie about the Vienna Boys Choir, an old Disney Movie, and I wished I could sing in a choir like that. So when Sister Carol announced it, it was just the best. We had about 50 or 60 boys in the choir and we did all right. So you had a very rich musical beginning, a great modeling of music-making from your parents – both of them, but your dad, especially. Music was a part of him and it became a part of you. Where did your love of music come from? Obviously your parents and family played a huge part. I have always had a real strong reaction and an interest and a love for music. It just seems to be something that I was born with. We always had little 45’s that we would play on our little kids record player – they were fun and we would listen to them for hours. And as we got older, we got our transistor radios and were always listening to pop music. I was always very moved by music. Even just a note, I remember just waiting for a particular note in a song – it would just get to me. It makes sense to me because your parents clearly had a high aptitude for music, so you were born with a high aptitude for music, but then it was also supported daily because you saw your whole family being musical. You were a musical family. Yes, that’s how we lived our lives. How did you get connected with Music Together? Well, Denise and I were taking this course, a human potential course, and there was a fellow there by the name of Ken Guilmartin (Music Together’s founder!) and we got to know each other through taking this course. 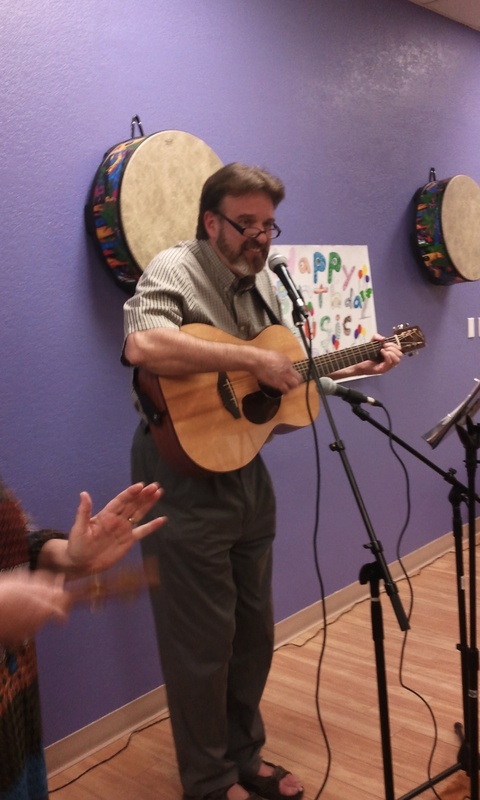 Denise and I were leading community moments in song and dance, some international folk dancing, but all kinds of songs that are just natural for creating community – sing along type moments – very rich and fun. So Ken heard me sing and they (Music Together) were at the point of beginning to make a new collection of CDs. He started to conceive or imagine expanding the Music Together family on the CDs and so they included a new singer, who we now know as Grandma Yvette, and Uncle Gerry was also added. So far you have celebrated Music Together’s 25th Anniversary in Ireland, California, New York, and Texas – with more to come. How has this experience of singing with all these Music Together families affected you? I have been deeply moved by this experience. One thing that has affected me or impressed me is that everyday you hear about all the troubles of the world and in this world of Music Together there are so many people doing it right. They are getting it right. They are raising their family with love, surrounding their children with love, and creating joy and fun and sweet memories that will last till their dying day – all the sweetness of these moments that they’ve shared together. I want your families to know that they are not alone. There is an international network, if you will, of people that are on the same wavelength, bringing good into the world and real love and just plain fun – they are bringing that into the world. I am very moved to see that and it just gives me hope. All of this has just given me great hope for this world. What else would you like the Music Together families to know? I want them to understand how deep the significance of spending time together this way is for their family memories and their family relationships. First of all, I feel that the music is like cement that bonds their hearts and even beyond that, it bonds their spirits – it keeps them together forever. I talked about my dad and how he sang and brought that into our family life and it lasted to the very last day of his life. I want the families to look twenty, forty, sixty years into the future, when they are sitting there with their little toddler or little infant, and imagine years and years from now, when they’re about to take their final last breath. We stood around the last bed my father would lay in, all my family and I, and we started to sing “Let Me Call You Sweetheart”, one of the old timey songs, and we didn’t even know if dad knew we were there. But when we got to the part “keep your love light glowing in your eyes so…” all of a sudden we hear a sound and it’s my dad, he’s singing – he sang the word “blue”. We couldn’t believe it! And we said, “Dad, you’re still singing with us!” And we said, “Let’s do it again!” and we got to that part and there was my dad again singing “blue.” He couldn’t talk, he couldn’t open his eyes, but he could sing. And just a few hours after that, he left this world and that’s the last thing he shared with us in his life – that note, and how precious that will always be. So there’s a much, much larger connection happening here that they’ll share all their life that they have together here in this world. Yes, there is a much larger connection happening here. The experience of Music Together that we all share is much more than just singing songs. We are creating lasting memories with our children and families. We are celebrating life together – our children’s developmental and musical milestones! We are leaning on each other and gaining wisdom from each other’s experiences as parents. We are creating beautiful communities – a place where we all belong and are needed. And yes, the music – ah, the music! We are supporting our children’s musical development just by surrounding our children with our music and dancing. What a gift Music Together is to all of us and what a gift Uncle Gerry’s voice and spirit is to our world.